These translucent Natural Agate puffy hearts, with subtle bands of Carnelian look like opalescent Sea Glass. Agate stimulates analytical abilities and mental precision. It has been reported to strengthen the sight, diminish thirst and promote marital fidelity. Beautifully polished 45mm or 1 3/4" puffy heart shaped gem stone. 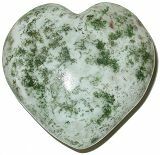 Deep Green Aventurine Puffy Hearts from India. Aventurine fosters integration of the emotions, enhancing creativity, clarity and augmenting the pioneering spirit. It is a well known healing stone. Beautifully polished 45mm or 1 3/4" puffy heart shaped gem stone. Tree Agate has a creamy white background with fractal like green fossil crystals. These stones also have small geodes lined with crystals. Agate was used in historical times placing the stones in water to ward off sickness. Beautifully polished 45mm or 1 3/4" puffy heart shaped gem stone. Large 2" Tree Agate puffy gem hearts with fractal like green fossilized plant crystals and tiny geodes lined with druzy crystals. Crystal masters use Tree Agate to refresh the senses and reinvigorate the joy of the moment in daily life. Beautifully polished 50mm or 2" puffy heart shaped gem stone. 2" W x 7/8" D - Velvet pouch included. Angelite is a new satin smooth gemstone discovered in Peru at the time of the Harmonic Convergence in 1987. It has become a very popular healing stone and a symbol of global love and light represented by the Harmonic Convergence. Beautifully polished 45mm or 1 3/4" puffy heart shaped gem stone. These 45mm Honey Aragonite Hearts are hand cut and polished from Peru and have exquisite gold and honey crystalline bands that display the development of the needle shaped crystal layers. Honey Aragonite has been used as a tonic and to uplift the spirit in times of difficulty. Each carved heart is uniquely hand cut and size varies slightly. Moss Agate is a transparent to translucent Agate containing inclusions of minerals resembling moss or foliage. Moss Agate leads one towards agreeability, strength in endeavors and efficacy in one's pursuits. It resonates to the Virgo energies and has wonderful grounding qualities. Beautifully polished 45mm or 1 3/4" puffy heart shaped gem stone. Madagascar Natural Fancy Agate 55mm & 60mm Jumbo Puffy hearts look like opalescent sea glass. These superb translucent natural agate hearts have excellent polish and amazing asymmetrical banding, some have sparkling Druze crystal formations. Beautifully polished jumbo 2 1/4" & 2 1/2" puffy heart shaped gem carvings with velvet pouch included. Unusual India Amazonite has a lovely smooth aquamarine blue color. Amazonite is the blue or green variety of a Feldspar called Microcline and is often used in jewelry. Amazonite fosters a deep clarity and an instinctive harmonizing which nurtures feelings of love and well-being. Beautifully polished 45mm or 1 3/4" puffy heart shaped gem stone. Gorgeous banded Chevron Amethyst super puffy hearts from India have the deepest color Amethyst found included with veins of milky or white quartz in a banded chevron pattern. In gemstone lore Chevron Amethyst is considered a powerful and essential tool for awakening and energizing the third eye and cleansing the Aura and other chakras. Beautifully hand cut and polished in India 45mm or 1 3/4" puffy heart shaped gem stone with velvet pouch. Rare Brazil Amethyst Hearts have an excellent even purple color. In crystal lore Amethyst is a stone of spirituality and contentment that magnifies the energies of Love, Forgiveness and Healing. Since ancient times it has represented the experience of metamorphosis or rebirth leading to self mastery and sobriety. Deep neon blue Apatite 56mm to 60mm Jumbo Puffy hearts from Madagascar have a translucent gemmy appearance. Apatite grows in hexagonal crystals in many colors and mimics other stones. Crystal masters use Blue Apatite for its high level of spiritual guidance and strong healing qualities. Beautifully polished jumbo 2 1/2"extra puffy heart shaped gem carvings with velvet pouch included. These extra thick Red Aventurine Hearts from India, have a deep orange-red color with bright particles of mica that create a subtle sparkle. Red Aventurine is believed to reinforce decisiveness and enhance leadership qualities and is a well known healing stone. 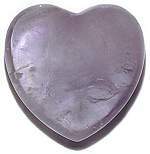 Each free form polished 45mm or 1 3/4" puff heart is unique and has smooth flat 1' H sides. Stunning semi translucent Robin's Egg Blue Aragonite Hearts from Peru. This lovely stone has excellent calming, gentle qualities that can soothe the nerves in difficult times or help one reach a relaxed state after stress. Beautifully polished 45mm or 1 3/4" puffy heart shaped gem stone with velvet pouch.